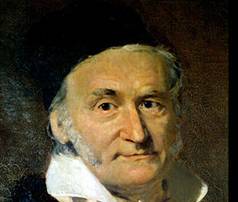 His formal name is Johann Carl Friedrich Gauss, although "Johann" is normally left out. However, to the mathematicians of the world, he is simply Gauss. Gauss contributed so much to mathematics that he is sometimes referred to as the Prince of Mathematics. Keeping to the royal theme, Gauss studied many scientific fields, but he was particularly fond of math. He is quoted as referring to math as the "Queen of all the Sciences." The teacher gave the students a list of numbers to add together as a means of "busy work." For example, the teacher asked the students to add all of the numbers from 1 to 100 together and get a final answer (how long would that take you?). To the amazement of his teacher and his classmates, Gauss was able to perform this in seconds by using the "trick" below. 1 + 100 = 101, 2 + 99 = 101, 3 + 98 = 101, and so on... Because there are 50 "pairs" that add to 101, the final sum should be 50 x 101 = 5050. Today, many historians question the validity of this "folk tale" but no one questions Gauss's brilliance. Simply stated, Gauss's mathematical genius is undeniable. He contributed so much to mathematics, but his largest contributions came in the fields of statistics, analysis, and number theory. Return from Carl Friedrich Gauss to other Famous Math People.